Would love to add to my vintage collection. You spoil us... you really do. They look lovely! Hope I win. Thanks! Quite an eclectic collection. Be an interesting set of winter reads. Quite an eclectic collection; it would be an interesting winter read. This would be an interesting winter read. I'd love to win! Thanks for the opportunity. I need some new (old) reads! 14 books? How can I not enter? Hand raised! Please add me to the giveaway! Thank you! What a splendid collection! I like the bookends too but realize they aren't part of the deal! Fabulous books. Please enter me. I've been enjoying your blog (mostly because I too love finding things in used books). Winesburg, Ohio is one of my favorites! I just got your book for Christmas! Love it! Great blog--interesting book selection giveaway-thank you. 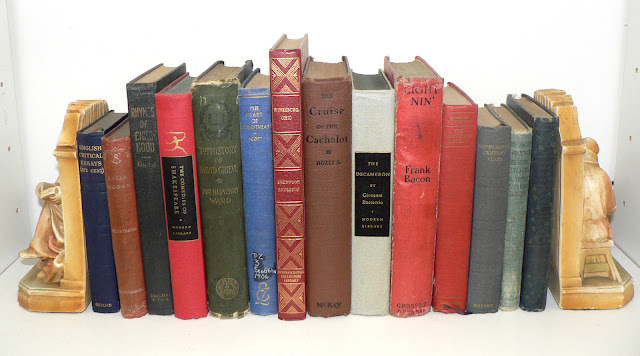 Great blog--interesting book selection giveaway. Thank you. A very nice variety of books--thanks for offering them! Random vintage; the best kind.